Paul Ryan is just renewing his call for Hillary’s classified briefing to be suspended. Why should she be trusted with classified information when she has already proven she can’t be trusted with it? 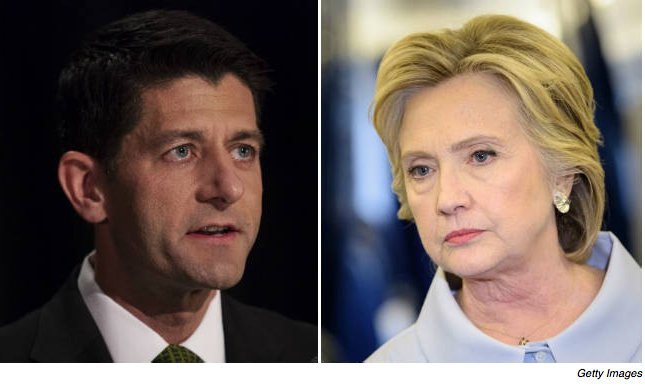 Speaker Paul Ryan blasted Hillary Clinton over the Friday news that the FBI is launching a new review into her use of a private email server while secretary of State. In a statement released minutes after the news broke, the Wisconsin Republican reasserted his call for Clinton to be denied the classified briefings she receives because she is the Democratic presidential nominee. “Yet again, Hillary Clinton has nobody but herself to blame. She was entrusted with some of our nation’s most important secrets, and she betrayed that trust by carelessly mishandling highly classified information,” he said. FBI Director James Comey wrote in a letter to Congress released Friday afternoon that the FBI is launching a new investigation after finding “that appear pertinent” in an unrelated probe.